On arrival in Johannesburg you will be transported to your lodge where you can opt for an afternoon (optional), evening or night drive. All activities are approximately 3 hours in an Open-sided 4×4 vehicle with a professional game ranger where you have the opportunity of sighting the Big 5 and many other mammals and many of our 507 bird species. Optional evening ‘Boma’ dinner around an African fire where you can taste all sorts of African cuisine and game dishes. All roads lead somewhere and while enjoying the diversity of wildlife the Kruger has on offer, we will make a stop for breakfast. Here the guests will have a chance to browse through the shops and visit the bank (Skukuza only) if they need to. After Breakfast we will continue with our Game Drive in search of the 147 mammal species, 507 bird species and 114 reptile species. En route we try to show guests as much as possible and with a bit of luck, we may just spot the elusive Leopard as well. Lunchtime also gives guests a chance to stretch their legs and enjoy the splendor of this magnificent place! After Lunch we will slowly make our way back to the Gate. This includes a “comfort stop” for the guests on the way at one of the many Camps or Picnic areas inside Kruger. The drop-off time is subject to the times indicated above. Optional: special operator rates at a 10% discount. After breakfast, guests will depart and enjoy a scenic drive to visit the wonders that the “Panorama Route” has to offer in the form of the Blyderiver Canyon, which is the third largest canyon in the world. There are a few viewpoints (God’s Window, The Pinnacle, The Three Rondawels) along the edge of the escarpment offering excellent views of the Blydedam, the canyon and the Blyderiver 600 meters below. The Berlin Falls, Lisbon Falls are at the point where the Blyderiver splits and large pools are formed. The Mac Mac Falls viewpoint offers a spectacular view of this waterfall. The Bourke’s Luck Potholes are deep cylindrical holes. Visitors can obtain a close view from bridges specially constructed over the potholes. Also visit the historic town of Pilgrim’s Rest which is now a living National Monument. It was established in 1873 when the first significant gold strike in South Africa was made in the area. Optional: We will give you our special operator rates at a 10% discount. After breakfast, guests are transferred in a luxury, air-conditioned vehicle to a nearby Swaziland border-post. This tour offers a unique perspective into the culture of the people in the Kingdom of Swaziland. 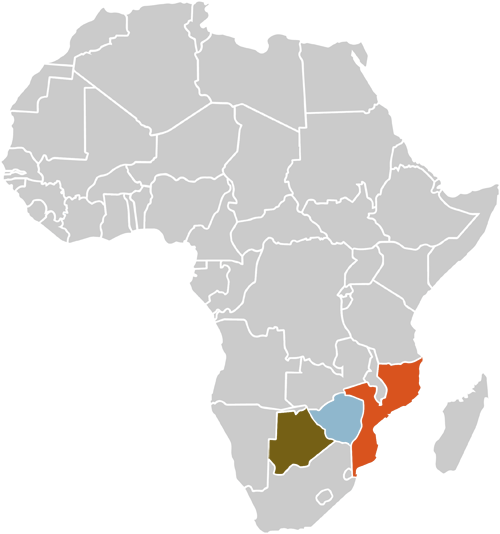 Named after the Swazi-speaking inhabitants, Swaziland is embedded between South Africa in the North, South & West and Mozambique in the East. A visit to the Glass-factory where they use mostly recycled glass, the candle factory and the Swazi Market will ensure full enjoyment of this cultural experience. After breakfast, guests are transferred in a luxury, air-conditioned vehicle to the Lebombo Border-post (approximately 2 hours) near Komatiepoort. From here it is a 45 minute drive to the Capital City of Maputo. This city’s economy is centered on the busy harbour situated in Maputo Bay. Interesting sites in Maputo include the Mozambican History Museum, the Roman Catholic Cathedral, the old Railway Station and of course the Traders Market. This tour offers a glimpse into the life and history of Maputo. Visa & border fees for clients are not included in this tour. Night Safaris in the Kruger National Park. From there they are taken via a Game Drive to a spot where they can enjoy the African Sunset while having a Sundowner. drink. After Sun downers and Game Drive, we slowly make our way back to the entrance where guests will be dropped off. Optional: at a 10% discount. Guests are met at a predetermined time by our qualified & experienced Safari Walking Guides at the reception of Nkambeni Safari Camp. As the day breaks, guests are briefed about the basic rules and associated risks involved with this activity (signed indemnity form required). They will be accompanied by the Safari Guides into the vast wilderness if the Kruger National Park. The guides will introduce a number of skills to the guests including tracking, animal behavior, identification of plants and trees… On these walks, wild animals may be encountered and this is where the Guide will facilitate the safety of the group and that of the animal. Transfer to O R Tambo for your flight to Cape Town. You will be arriving along the False bay coastline the late afternoon. Stroll around the Cape’s fabulous ‘bohemian’ fishing village of Kalk Bay. Many restaurants with awesome sea views to choose from. Today we will drive to Stellenbosch, a fertile area where wheat, vines, and oak trees quickly replace the giraffes, elephants, Hottentot, and Khoisan peoples. Today, Stellenbosch is known for its beautiful varied architecture, renowned wines, and university where the language of instruction is still mainly Afrikaans. We will visit a museum, a historical shop, and partake in a cellar tour before travelling over the beautiful Hels Hoogte Pass on our way to Franschoek. We will then break for lunch and for a visit to the Huguenot Museum. You can also visit an exceptional boutique wine farm to taste local vintage wine including a pinotage which is South Africa’s own unique cultivar. Next, at Paarl, we will stop in front of Mandela’s statue at the entrance to the prison from which he was liberated in 1990. The Taal monument, dedicated to the Afrikaans language, is the world’s only monument to a language. You will end the day with a dinner at a restaurant of your choice. This region is a UNESCO site for its floral diversity. We will follow the West coast via Clifton with a stop at Maiden’s Cove to enjoy a magnificent view of the Twelve Apostles. We will continue along to Hout Bay, a charming little town where we enjoy a cruise to Duiker Island, home to the world’s largest fur seal colony. The scenic Chapman’s Peak Pass offers breathtaking scenery. Next we will be visiting the Cape of Good Hope Nature Reserve which is where the cold Atlantic waters meet the warm waters of the Indian Ocean. This famous landmark was named by the early Portuguese mariners. Journeying down to the False Bay coast, we have lunch at the old harbor of the historical port of Simon’s Town. Our next visit is the well known Boulder’s beach, home to Africa’s largest land based penguin colony. We finish our day with a visit to Groot Constantia. Africa’s oldest Cape Dutch manor home. A stroll along the Sea Point promenade at sunset perhaps.. and visit the V & A Waterfront for dinner. Today we will visit Cape Town, historical places, parks, Dutch East Indian Garden, Castle, South African Museum, Malay quarter, District 6, and Green market square. Before noon we will take the opportunity to visit the noon gun in action on the slopes of Signal Hill. It is the world’s oldest canon still in action. After lunch we will visit Kirstenbosh National Botanical Garden, the only botanical garden situated in a world heritage site; it has more endemic plant species than any other in the world. Later in the afternoon, we will head along the west coast towards Blouberg where we will enjoy a “postcard” view of Table Mountain, Robben Island, and Table Bay. Tonight your farewell dinner will be an authentic African dinner of many culinary dishes from across the continent, accompanied by dance, music, and theater. Transfer to the airport for your air transport home. Depending on your departure time, various activities can be arranged.